The food service business is a very competitive industry, where cost control is crucial. Restaurants can use today's new energy saving products coupled with the wide range of utility rebates and tax incentives to greatly reduce energy related operating costs. 2.Space area within the facility. To obtain an Energy Policy Act (EPAct) Section 179(D) minimum tax deduction of 30 cents per square foot the facility has to reduce its watts per square foot from ASHRAE 90.1 2001 standards by at least 25%. Full tax deduction of 60 cents per square foot occurs with a 40% watt per square foot reduction. 2.The so called back of the office meaning kitchen, food prep areas, storage, walk-in coolers and freezers, utility rooms, offices and restrooms. In general, the back of the house spaces can use common categories of very efficient lighting to maximize energy savings, rebates and tax savings. Ambience in these areas is not as important. In cafeterias and fast food types of restaurants, the kitchen portion of the back of the house is often part of the same room as the customer serving area. Generally, it is easy to design lighting in the one “main room” that will qualify for maximum utility rebates and EPAct tax incentives. It will also be easier to include the bar space in one room fast food establishments, which often include pizzerias. During the economic recession, many independent restaurants closed their doors. However, many of the larger family focused national chains have persisted. Some of the nation’s largest restaurant chains have numerous brands and some substantial square footage. The attached chart is intended to illustrate the potential magnitude of EPAct tax deductions available to these facilities. 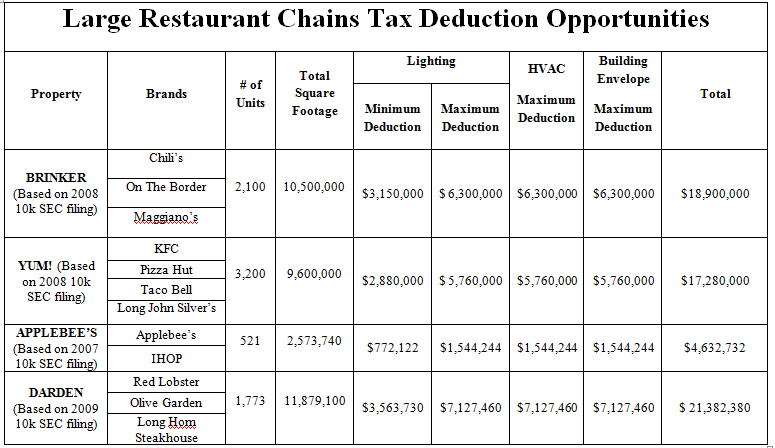 Consider expanding the lighting project so that the weighted average of the other food spaces enables the bar lounge/leisure area to qualify for tax savings. Attention to design should enable the spaces to qualify, especially if the behind the counter lighting space is retrofitted at the same time as the customer service area. Consider mixing in LEDs to achieve the desired wattage targets. Most restaurants use package roof top units for HVAC needs. The key is to pre-order high efficiency new or replacement units. It is only the highest efficiency units that will generally qualify for utility rebates and tax savings. Most large restaurant chains utilize life cycle package unit replacement programs where they can plan into energy cost reduction, maximize utility rebates and EPAct tax savings. In restaurants, the high ventilation levels necessary in commercial kitchens make efficient air handling systems particularly important. The opportunity to improve customer air quality means it is important for restaurants to consider the best of the breed air handling equipment. This equipment not only improves employee and customer health, it provides the added benefit of tremendous energy cost reduction which may be eligible for section 179(D) EPAct tax savings. Restaurants have numerous supplemental high cost electric loads including: freezers, refrigeration, ice machines, stoves, dishwashers, coffee makers, fryers, other kitchen appliances, food prep equipment, wide screen TVs and computers. Many utilities offer rebates for some of this equipment, particularly equipment that is at the energy star level or higher. LEED, which stands for Leadership in Energy and Environmental Design, is the coveted mark of achievement (based on points) to demonstrate a sustainable building "The LEED program was originally better suited to large buildings and was first applied to office buildings" said Richard Young, a senior engineer with the Pacific Gas and Electric Food Service Technology Center . Now, however, LEED is becoming more applicable to all types of buildings including restaurants, as the new 2009 LEED system includes a greater proportion of LEED points for energy reduction. LEED restaurants are particularly well positioned for EPAct tax savings since LEED restaurants must be modeled in energy simulation model software and the section 179(D) deductions also require modeling in IRS approved software. Recently some of the leading large unit fast food restaurants have achieved their first LEED certified restaurants. Some of the first movers include McDonald's, Dunkin Donuts and Chipotle. This is a smart strategic move since it enables them to have an extremely energy efficient experimental/beta restaurants that can be closely evaluated. Very importantly, many local zoning and planning boards that may have reservations about issuing permits for fast food franchises are much more amenable to LEED design and in fact may fast track them. The following table summarizes the energy efficiency aspects of the three chains first LEED initiatives which in most cases should result in a $1.80 per square foot EPAct tax deduction per facility. The LEED McDonald’s and Chipotle locations listed above were both part of the LEED for Retail pilot program, which gives chain retailers and restaurants an opportunity to certify several properties based on the same LEED-approved sample location. In addition to fast-tracking the LEED certification process, having multiple, similarly designed energy-efficient properties allows results from one location to be easily duplicated for Section 179(D) tax deduction purposes. Pizza Fusion, a Florida based concept, has seven units registered in the LEED system and two in the final stages of completion. This is one example of up and coming chain restaurants aspiring to LEED standards, a smart move for energy-efficiency and corporate image as well as EPAct tax deductions. Restaurants have new and expanded opportunities to use tax savings and rebates to save energy, and improve the customer environment. Many of these opportunities require a team approach involving design teams and tax professionals. Goulding, Charles R., Jacob Goldman, and Taylor Goulding. " The Economic, Business and Tax Aspects of Light Emitting Diode Interior Building Lighting "" Corporate Business Taxation Monthly (2009): 31-32 Print. Goulding, Charles, Taylor Goulding and Amelia Aboff. “LEED 2009 Expands EPAct Tax Savings.” Corporate Business Taxation Monthly September 2009.